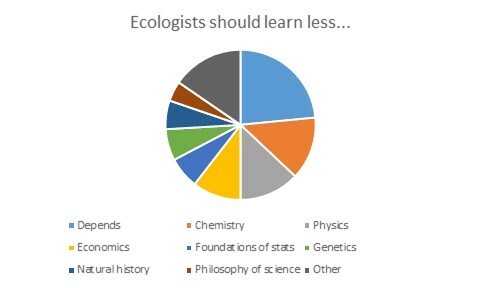 Poll results: what should ecologists learn less of? Here, for what they’re worth*, are the results so far from yesterday’s poll asking readers to name the most important thing for ecologists to learn more of, and the thing they should learn less of in order to free up time. We’ve gotten 165 responses so far, and based on past experience the results won’t change much if we wait any longer. No consensus for either question. And not only that, every topic got at least one vote as the most important thing for ecologists to learn more of, and at least one vote as the most important thing for ecologists to learn less of! I think this is a useful reminder of just how diverse ecologists are in terms of their background knowledge, motivations, interests, and expertise (which I think is a good thing, by the way). Most popular answer to both questions was “it depends”, which I interpret as a vote in favor of flexible curricula that let different people specialize on different things according to their own needs and interests. That’s what many (not all) graduate curricula are like, of course. 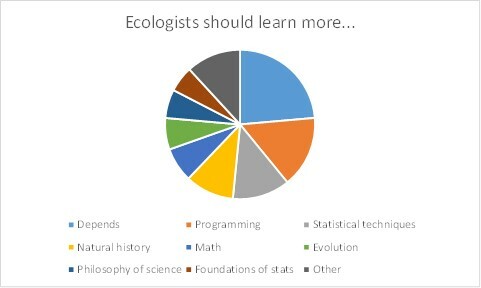 Probably no surprise that the next two most popular choices for what ecologists should know more of were “programming” and “statistical techniques”. For obvious and very good reasons, there’s a long-term trend for all fields of science to become more quantitative, and to make heavier use of computers. Then natural history, math, and evolution. Next most popular choices for what ecologists should know less of were “chemistry” and “physics”. I interpret that as a vote against the common North American practice of requiring all science majors (not just ecologists) to take introductory physics and introductory chemistry. Curious to hear discussion of this. After that was “economics” and “mathematical foundations of statistics”. Ecologists aren’t ordinarily taught anything about either of those, so I suspect that votes for these were just people’s way of identifying the least-important subjects on the list for ecologists to know, whether or not those subjects are actually part of current ecology curricula. Next was “genetics and molecular biology”, followed by “natural history” and then “philosophy of science”. There were no obvious associations between what folks thought ecologists should learn more of, and what they thought ecologists should learn less of, except that most (but not all) people who said “it depends” for one question also said “it depends” for the other. If for each topic you take the difference between the number of votes for more of it and less of it, you get a crude index of respondents’ net desire to see ecologists learn more of it. By this measure, the topics rank as follows: programming +20, statistical techniques +15, math +11, evolution +9, natural history +7…[skipping some]…economics -16, physics -19, chemistry -21. And the topics in the middle were those that received few votes for either question. There weren’t any hugely controversial topics that lots of people really want ecologists to learn more of and lots of other people really want ecologists to learn less of. Instead of teaching more or less of something I suggest to much more encourage undergraduate students to do more collaborations within and across departments and disciplines. I suppose it’s worth mentioning it seemed as if the poll was directed at ecologists as a whole, but in your explanation of a few points, it seemed to be more directed at “graduate students in ecology”. So, my answer to either of those may change depending. Could be, but hard to say. Our readership is undoubtedly a non-random sample of all ecologists, but we only have basic demographic data from an old reader survey. Like, *any* blog, not just this one? I dunno about that. There are lots of natural history blogs in the world, or blogs covering natural history topics among other things. For instance, Ed Yong’s Not Exactly Rocket Science is probably one of the most popular science blogs in the world, and he writes lots of stories about amazing or unusual bits of natural history. I’m sure there are scads of nature photography blogs. Etc. For things like chemistry or physics, perhaps it is the way these subjects are taught that doesn’t appeal to ecologists. There’s a lot of both wrapped up in plant physiology and soil-plant relations, but very different from typical first year courses in either. I also remember taking a course in glacial geology, in which we learned so much about natural history, but also important (and nifty) physical and chemical properties of water in all three of its states.